"The path to prosperity is to civilize these savage inner cities... but ignore everything Romney and I had said prior to the debate." Paul Ryan sat down for an interview on Monday with ABC 12 in Flint, Michigan, and things didn't go quite as planned. The GOP vice presidential candidate responds that "this country has a crime problem." When the reporter asks for clarification, Ryan explains that "good, strong gun laws" are currently on the books, "but we have to make sure we enforce our laws." "We have lots of laws that aren't being properly enforced. We need to make sure we enforce these laws. But the best thing to help prevent violent crime in the inner cities is to bring opportunity in the inner cities, is to help people get out of poverty in the inner cities, is to help teach people good discipline, good character. That is civil society. That's what charities, and civic groups, and churches do to help one another make sure that they can realize the value in one another." ABC 12's reporter then offers a somewhat odd retort, asking, "And you can do all that by cutting taxes? By...with a big tax cut?" "Those are your words, not mine," answers Ryan. A voice off-screen then implies that the interview is over, telling the reporter, "thank you very much, Sir." Ryan then abruptly stands up and removes his microphone, immediately ending the interview and telling the reporter, "That was kind of strange. You're trying to stuff words in people's mouths?" Essentially, in response to a question regarding firearms and crime, Paul Ryan shifts to poverty in the inner cities, with a solution of civilizing these people by teaching them "good discipline" and "'good character." Logically, the reporter related Ryan's comments to the policies advocated by himself and his running mate - tax cuts. The reporter didn't specify tax cuts on who but just tax cuts in general, but Ryan wasn't having it - his handlers off screen put the kibosh on the interview and Paul Ryan left calling the question "strange." Ryan spokesman Brendan Buck later told BuzzFeed: "The reporter knew he was already well over the allotted time for the interview when he decided to ask a weird question relating gun violence to tax cuts. Ryan responded as anyone would in such a strange situation. When you do nearly 200 interviews in a couple months, eventually you’re going to see a local reporter embarrass himself." The Ryan response is interesting. He blames the reporter for linking gun violence to tax cuts despite Ryan being the one to say that the "best thing to help prevent violent crime" is to "help people get out of poverty in the inner cities." He then attacks the reporter personally and insists his interview was well over the time limit. So if Ryan intended this to be a strictly guns answer, was he proposing increasing the amount of guns in the inner cities to lift these people up out of poverty? Ryan's initial response is more in line with Romney's "47 percent" comments secretly recorded earlier this year and Ryan's own "welfare state" comments. "There are 47 percent of the people who will vote for the president no matter what," Romney said at a fundraiser in May. "All right -- there are 47 percent who are with him, who are dependent upon government, who believe that, that they are victims, who believe that government has the responsibility to care for them. Who believe that they are entitled to health care, to food, to housing." "Seventy percent of Americans want the American dream. They believe in the American idea. 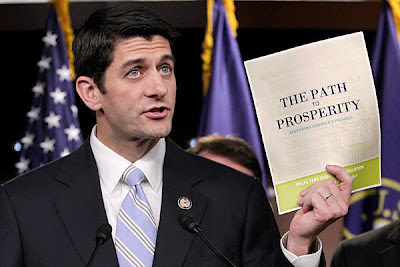 Only 30 percent want their welfare state," Ryan said. "Before too long, we could become a society where the net majority of Americans are takers, not makers." Sounds to me like Ryan's response to the ABC reporter was one not about guns but about taxes and what Republicans classify as "personal responsibility," where the "takers," as Ryan would put it, have no "discipline," "character," or "value." Ryan's handler probably realized that the real Ryan was coming out in the interview and was not inline with moderate Debate Romney so he pulled the plug.